Rem With an aim to make Puce 100 per cent garbage free by the end of 2016, the Poonawalla Group's Serum Institute of India has collaborated with the Pune Municipal Corporation (PMC) to initiate the Adar Poonawalla Clean City powered by Noble Exchange. 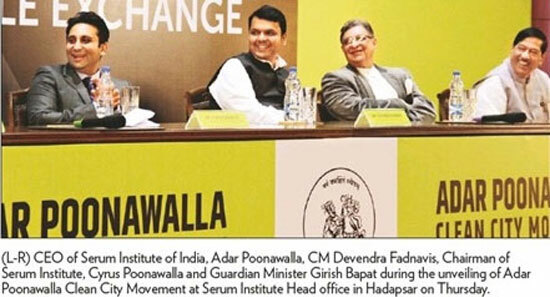 The movement was inaugurated at the hands of CM Devendra Fadnavis at the Serum Institute of India head office at Hadapsar on Thursday morning. Among those present at the event were Chairman of Serum Institute Cyrus Poonawalla, CEO Adar Poonawalla. Guardian Min ister Girish Bapat. Municipal Commissioner Kunal Kumar. BJP spokesperson Shaina NC, local MLA Yogosh Tilekar, Dy Mayor Aba Bagul and other corporators. Fadnavis lauded the initiative and stressed on the need of a decentralised systems for waste management and expressed to take the movement to other cities. "Serum Institute is initiating basic sanitation work in the city. Safety and sanitation have been the priorities for all the 10 cities selected for smart city. If we want to make cities sustainable. there is a need for cleanliness and good sanitation. The decentralised system will bring down the costs of garbage management and increase efficieny" he said. APCCM is a green Initiative with a motive of making cities more liveable through efficient and ecofriendly waste management. While speaking on the occasion. Adar Poonawalla said that there is need to not only improve hygiene and sanitation but also how our city looks. He also added that a fleet of specially designed garbage collection vans and thousands of bins will ensure removal of wet waste from the city. While speaking at the event PMC Commissioner Kumar said this movement will set the tone for what Pune can do. "We aim to make Pune 100 per cent garbage free by end of 2016 and free of open defecation by Gandhi Jayanti in 2017. We will create a complete system for decentralised waste processing with the upcoming 300 tonne waste proccesing plant at Talegaon, smart bins and a new collection mechanism with mobile processing units. A three-year long campaign to create awareness and increase public participation has also been planned," he explained.